Product #20689 | SKU 094800-0000-110 | 0.0 (no ratings yet) Thanks for your rating! 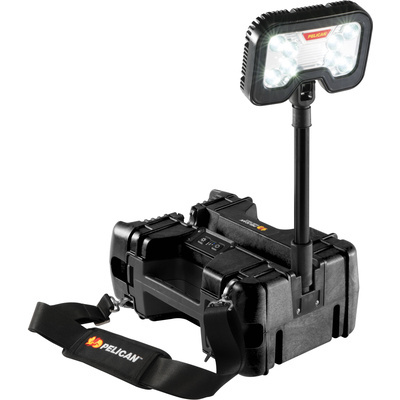 Whether for recreational or professional use, the black 9480 Remote Area Lighting System from Pelican will shine a bright light on your activity, with a maximum output of 4,000 lumens and a maximum runtime of 28 hours. Weather-resistant thanks to its polypropylene copolymer housing, the RALS delivers 4,000 lumens on high, 3,000 on medium, and 1,000 on low. There's also a flashing mode for emergency signalling. The head contains 8 powerful LEDs and delivers a beam of light with a wide 125° spread. When the 61 cm mast is deployed, the head can be rotated 340°. To provide you with an uninterrupted operation, the battery pack features a modular design and can be easily replaced with a fully charged pack within seconds. It contains a rechargeable 12V sealed lead acid battery which will last from 6 to 28 hours, depending on a selected brightness mode. The pack also has a built-in battery status indicator and a silicone rubber control keypad. Additionally, this lighting system has a built-in Bluetooth and can be operated remotely from a free iOS app. For easy carrying the system has a long handle and steel pins for attaching an included shoulder strap. Also included with this lighting system is a power cord.